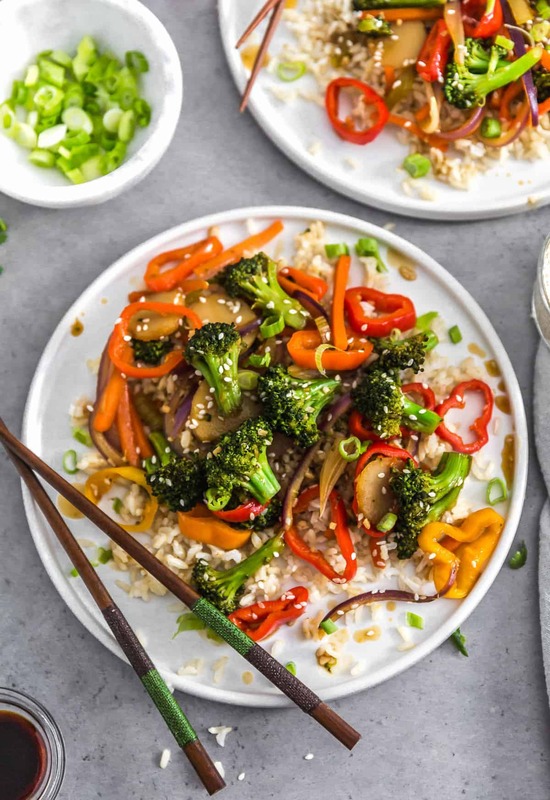 Incredibly easy and fast to make, this Asian Veggie Stir Fry is bursting with flavor and tastes delicious. The flavors are bright and colorful. It is loaded with tons of veggies, and the best part is it is ready in 20 minutes or less. 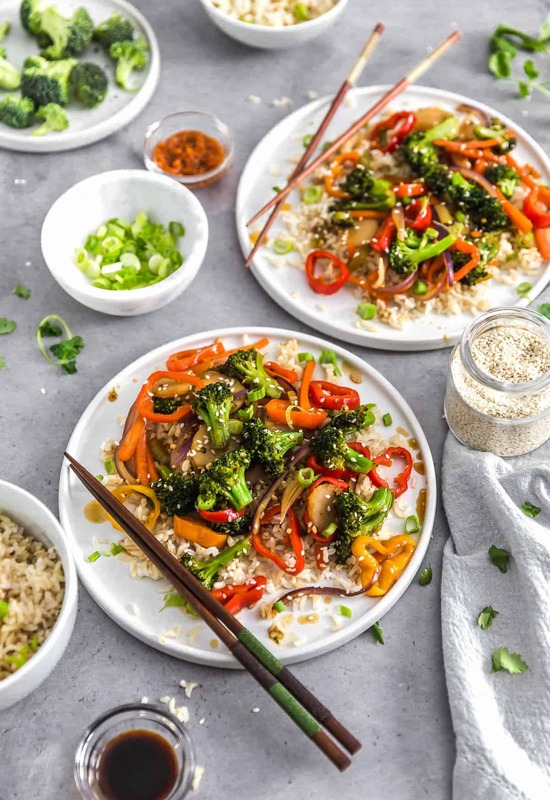 This recipe boasts no oil, is healthy and so good for you, making it an ultimate Whole Food Plant Based “dinner in minutes” recipe! Vegan, no oil, no refined sugar, no highly processed ingredients, and gluten free. We typically always have a large bowl of brown rice in the fridge. 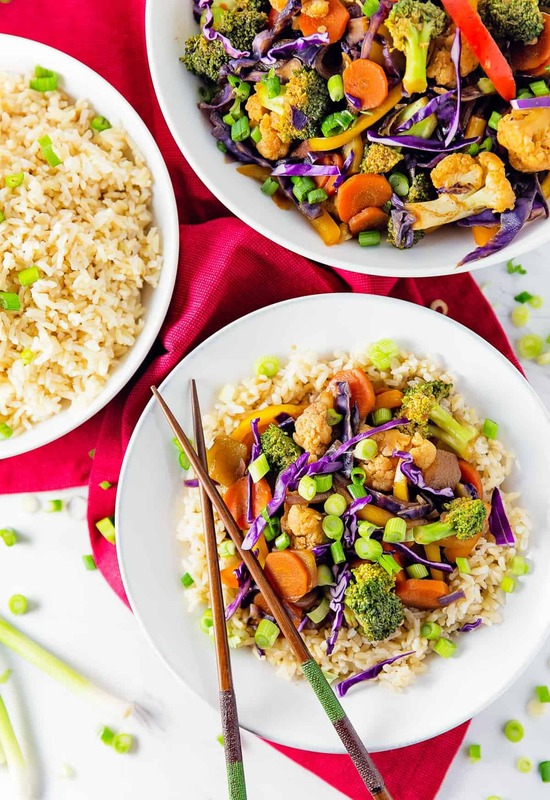 This way, if we are in a pinch on time, we can couple it with a veggie stir fry or use as a side dish for a ton of other quick and easy veggie bowls. Let’s face it, being able to cook a tasty, filling, and delicious meal can sometimes be challenging when cooking Whole Food Plant Based, right? Why? Well, for several reasons, it can sometimes be time consuming because you are literally making everything from scratch with whole foods or using minimally processed foods. I love being able to feed my family delicious and healthy meals where I know what is going into the food that I am preparing for them. It is important to me to know that I am creating meals that are full of vitamins and nutrients that support a healthy body. Also, many processed foods are chemically engineered to taste great. They have chemicals like MSG, and their derivates that trick the brain into a state of euphoria making us believe that the food tastes amazing. It’s hard for to get past that and to readjust our taste buds. In other words, get those taste buds back to the “factory” setting. That is why so many people who first start eating Whole Food Plant Based can’t get too excited about the food. It takes a while to detox. Yup, you simply have to detox yourself to get rid of all those chemicals in your system that keep you coming back for more unhealthy food. Easier said than done; some folks even find themselves getting nauseous and light headed while they transition. 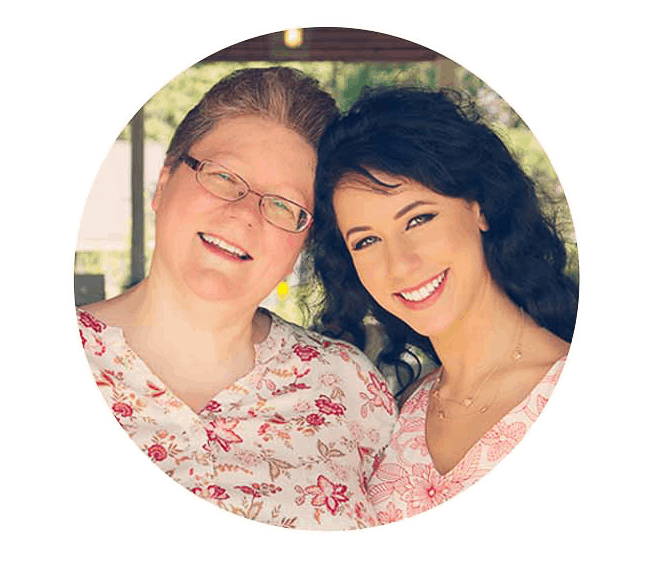 We talk a lot about MSG in our blog simply because it is in everything! It hides under a ton of different names. Why are we so concerned? Because as stated before, MSG is a chemical flavor enhancer that tricks the brain into thinking the food tastes better. It is the very reason why so many people are addicted to junk food. Guess what? If a food manufacturer uses an ingredient from another company to make their product and that ingredient has MSG in it, the final product doesn’t have to label that it contains MSG. They can say that their product contains no MSG, even though it does! Crazy, right? Allow me to provide you with an example. Suppose Company X makes a dry soup mix, but they don’t make every single component of the dry soup mix themselves. Maybe they purchase the bouillon base mixture from Company Z. Company Z uses MSG (or a derivative) in their bouillon base and they sell it to Company X to finish the final dry soup mix product. Company X can state that their dry soup mix does not contain MSG because they didn’t add it. Just another supporting reason why the Whole Food Plant Based movement is gaining a huge following. People are tired of the food industry veiled guidelines that allows them to pretty much do whatever they want. The Whole Food Plant Based lifestyle is gaining momentum. 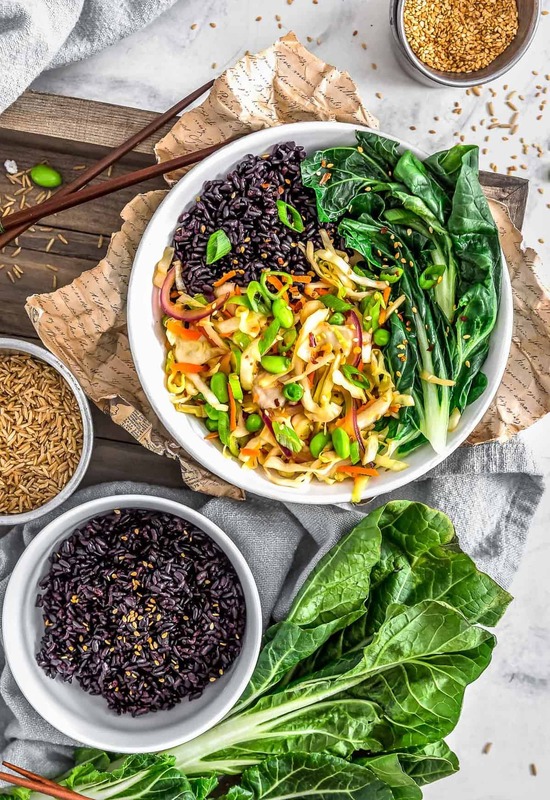 More and more people are determined to gain control over their health by eating a diet rich in plants, veggies, fruits, whole foods, nuts, grains, and seeds. Say goodbye to unhealthy food choices and start a journey devoted to foods that will nurture your body to become strong and healthy. This dish is so tasty, healthy, and good for you. We make it ALL the time. 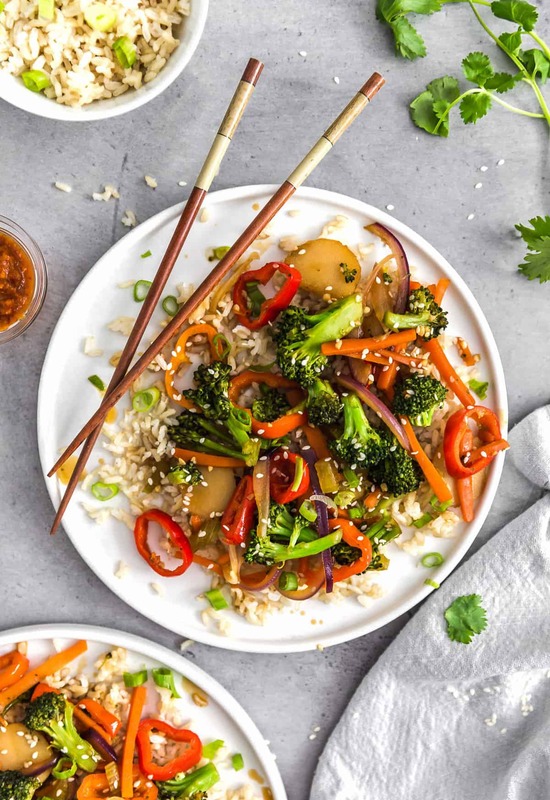 The veggies are crisp and flavorful; the sauce allows the lightly sautéed veggies to shine through. We absolutely love it, and we know you will too! The Whole Food Plant Based lifestyle has made so many positive impacts in our lives. We feel so much healthier. Veganism is up 400% in the USA. Restaurants are starting to recognize the importance of offering vegan options. We would love for more restaurants to offer Whole Food Plant Based options. I believe that this will happen over time. It is an exciting time to be Whole Food Plant Based. 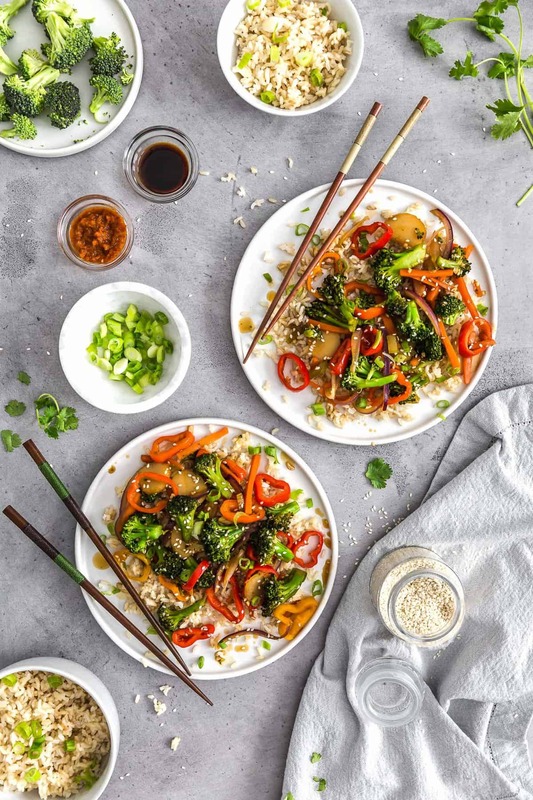 Incredibly easy and fast to make, this Asian Veggie Stir Fry is bursting with flavor and tastes delicious. The flavors are bright and colorful. 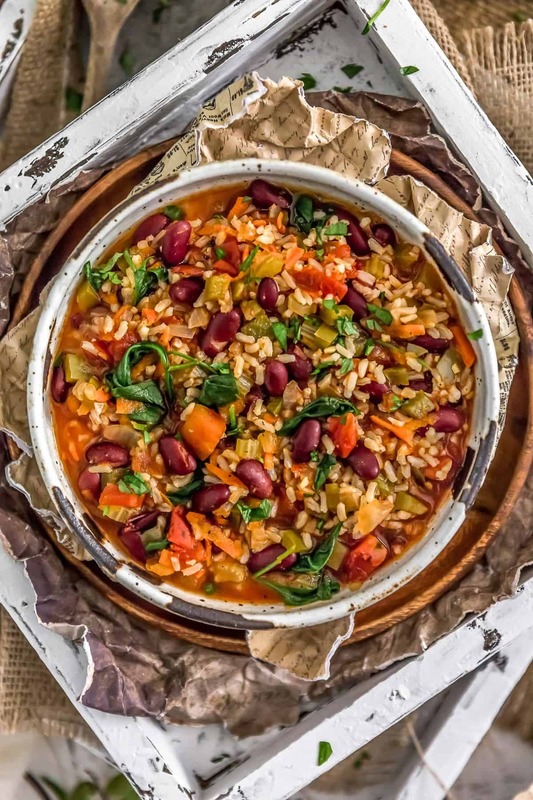 It is loaded with tons of veggies and the best part is it is ready in 20 minutes or less. 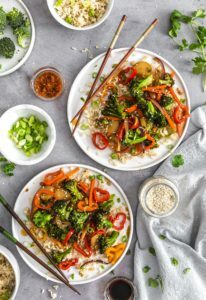 This recipe boasts no oil and is healthy and so good for you making it an ultimate Whole Food Plant Based “dinner in minutes” recipe! Vegan, no oil, no refined sugar, no highly processed ingredients, and gluten free. In a small bowl, mix ½ cup Teriyaki sauce, 2 Tablespoons Tamari and whisk in 2 teaspoons cornstarch until all the lumps are dissolved. Set aside. Place a large skillet on the stovetop and place ¼ cup of water in it. Turn the temperature to high, once the water boils, add the carrots and broccoli, put the lid on the skillet and cook on high for 2 minutes. 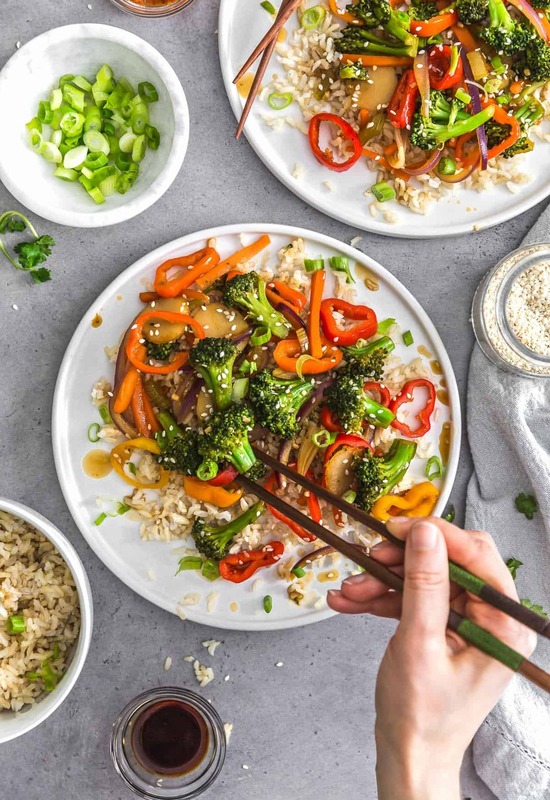 After 2 minutes, add all the remaining veggies including Teriyaki, Tamari, cornstarch mixture, stir until the mixture has thickened, about 3 minutes. Remove from heat and add the sesame seeds, and allow to sit for 2 minutes. 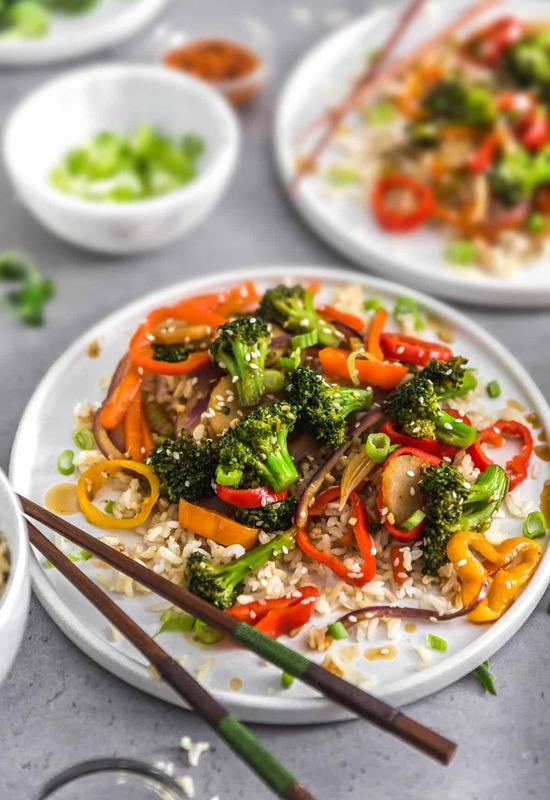 Top individual servings with sesame seeds, sliced green onions and Sriracha sauce. Yumm. I could eat this everyday and never get tired of it. I love stir fries!! Beautiful photography, beautiful food, beautiful people.. totally inspired by this, thank you!